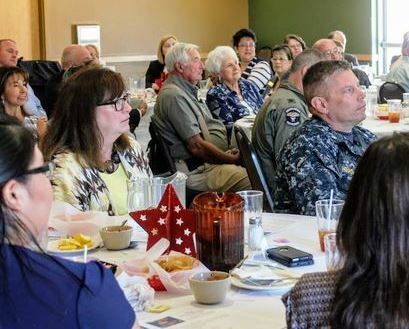 There was a packed house at the Alamogordo Chamber of Commerce meeting where Air Force Base Col. Houston Cantwell discussed the F-16 relocation. The economic impact over the next 20 years of bringing two additional F-16 Fighting Falcons training squadrons to Holloman Air Force Base could be in the billions. Later this summer, the two training squadrons are expected to be added to the New Mexico base located six miles from Alamogordo, N.M. Both Holloman and Alamogordo are served by TDS. Most of the new positions, Mick said, are military personnel, civilian contractors and mechanics that will maintain the F-16s at Holloman Air Force Base. The new F-16 squadrons are coming from Hill Air Force Base in northern Utah. Hill Force will be the new home for the F-35 Lighting II joint strike fighter. For now, the relocation is temporary, but the U.S. Air Force is expected to make a decision soon on whether Holloman will be a permanent location for the F-16 training squadrons. Mick, who serves as secretary/treasurer of the Alamogordo Chamber of Commerce, said the community is working hard preparing to welcome and show these future residents that Alamogordo is a great place to live. “Alamogordo has great weather, friendly people and so many outdoor recreational activities,” she said. The Sacramento Mountains border Alamogordo on the east and to the west is White Sands National Monument. “We are so close to wonderful hiking, camping and fishing opportunities,” she said. The drive for the Air Force to expand is that Holloman is already a significant formal training unit for F-16 pilots and this area of New Mexico has an unmatched amount of airspace to practice and train. In addition, the move addresses the Air Force’s shortage of about 700 fighter pilots. By the end of the summer, Holloman will have about 31 additional aircraft on site. Eventually, there will be 45 additional F-16s to train the pilots. Currently, Holloman Air Force Base has 55 F-16s.